This morning Lannister banners adorn the walls of Cáceres, extras congregate for Game of Thrones filming, and there’s no doubt that King’s Landing has once again been reborn on location. There’s a slight twist however: the rains of Spain will provide an unexpectedly authentic touch today, though apparently it’s not slowing down filming. Bad weather season has finally come to the capital city of Westeros. How long before winter arrives on their doorsteps? 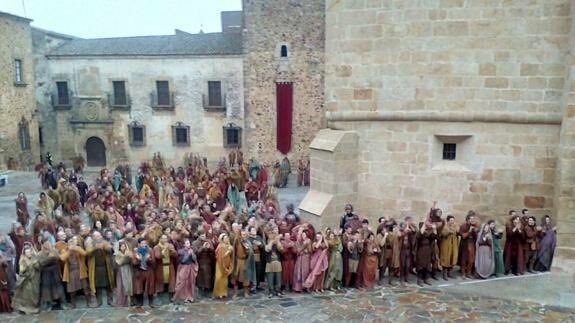 Hoy confirms that filming starts today in the Plaza de Santa María and its surroundings, and then on Thursday, shooting will focus on the Plaza de las Veletas. 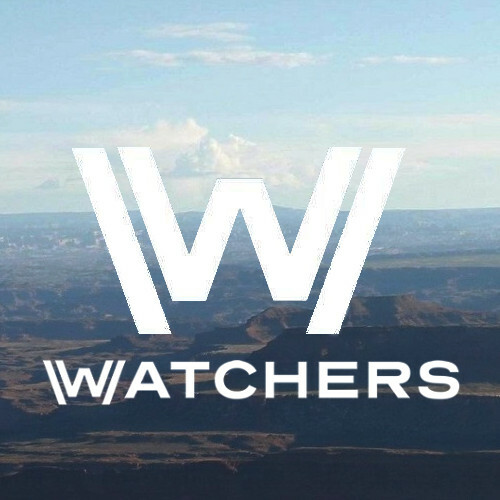 The crew has been busy getting the locations ready for season seven filming over the past week. 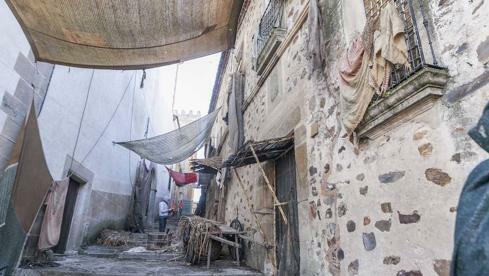 Filming will take place around the plaza and the areas close to it, such as the Cuesta de la Compañía, which has been draped with awnings to take on the look of a King’s Landing alleyway. You can see extras arriving to work in this video clip, dressed as typical denizens of King’s Landing, Lannister guardsmen, Gold Cloaks, and some black-clad men. It’s not clear who they are. The style of costume is a bit similar to the Ironmen’s costume, but the black is unusual. A new look for Euron Greyjoy’s men, perhaps? And the good old G&H trailers set up in town for the crews earlier today! The question now, is what are they filming for King’s Landing? Cersei (Lena Headey) is usually the go-to guess for KL filming…but Headey just arrived in Dubrovnik, along with Hafthor Bjornsson, and Nikolaj Coster-Waldau is also in Croatia. If the scene doesn’t involve Cersei, Jaime, or the Mountain, who is part of it? Yesterday we saw Indira Varma and Rosabell Laurenti Sellers arrive in Cáceres, so it looks like Ellaria and her daughter Tyene are part of shooting on at least one of these days. Hopefully today’s public filming will bring more answers and clarity! After wrapping up these scenes over the next two days, Game of Thrones will be officially done with their month of shooting in Spain! The show is expected to take a break over Christmas, and to resume filming after the new year begins, with shooting going until February. Update: Fans have run into a newly arrived John Bradley in Spain! 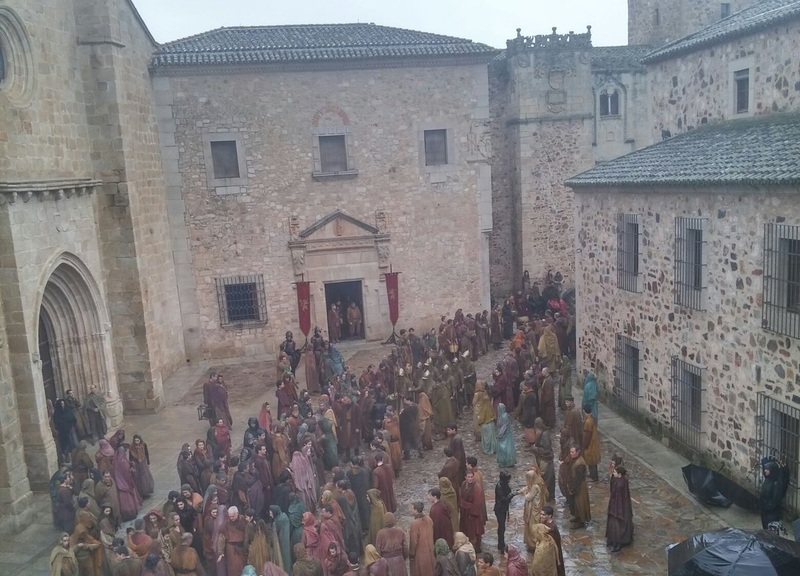 Which means we might see some Oldtown filming in the streets of Caceres, since Sam is likely to stay there and not be in King’s Landing anytime this season. Sand Snakes Showily Slither Into Spain: Indira & Rosabell Sighted in Cáceres! New Photos of Lena Headey and Nikolaj Coster-Waldau Filming Game of Thrones in Dubrovnik! Cersei’s hair is as short as it was in 610, and Jeremy Podeswa is in the pics. Whatever they’re filming in those photos, it’s from the premiere episode. Also a badass looking guy in black armour. Is he a Queensguard? All hail The Mad Queen! Her dress is amazing, Michelle Clapton is a genius. Beautiful! Michelle knows how to bring out Cersei’s inner sith. Is that black armor new Kingsguard armor? If so, can Cersei rule forever just so I can look at it lol? Everyone go home! Give Michelle her EMMY now! There might be rain in Spain, but is Caceres on the plain? Shame that Michelle couldn’t make the same kind of effort for King in the North. 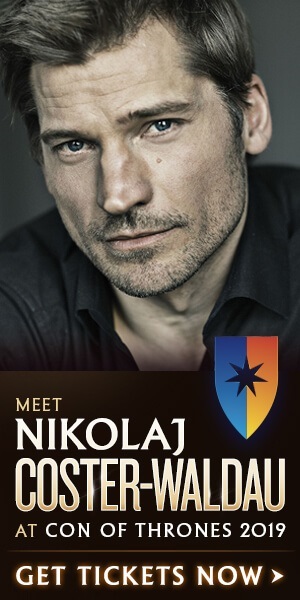 He looks so lame and poor in comparison to a Queensguard, and he’s supposed to be a King of half of Westeros. Yes with that I agree. I know Jon is supposed to be somber and all that, but I want some amazing clothes for him too. And Davos desperately needs new costumes as well, especially as a king’s main adviser. But as importantly: Millie Bobby Brown! Because he is in comparison. He has large land that is not exactly fertile with winter and all. And he’s only ruling over a small percentage of Westero’s population. Is the Yara actress there as well? I want to know the fate of the character. Davos is the new Jorah. Now that Jorah finally got a costume change, they need to fill the ‘never changes clothes’ quota. They chose Davos. It’s kinda funny how KITN and his army/Daenerys, her guards and army look so inferior to Cersei, her guards, Lannister army and Jaime when it comes to costumes and looks. That is on purpose. It’s not simply a lack of effort. The Northerners and Starks in particular live a more austere life. Of course Jon wouldn’t be wearing fancy clothing like the Lannisters, who are famous for their opulence. But as importantly:Millie Bobby Brown! Yes!! I’m sad for Lena, she deserves a nomination more than Peter. This as well. Lannister are more fancy. Southern houses in general dress more fancy than the northern ones. Yeah, it would be out of place for Jon to be wearing pompous clothing. The North is about practicality not ostentation. They’re also not ‘rich.’ The KitN is a king of lots of harsh land populated by few numbers compared to the rest of Westeros so saying ‘half of Westeros’ isn’t really equal. What do you expect the Northerners to look like? They never wear overtly fancy clothes. The North is a cold, harsh land and their dress reflects it. They usually wear grey’s and browns. Dany and her advisers all look pretty good to me. The Unsullied have their armor and the Dothraki are foreign horse lords not pampered Southern guards? How would you expect them to dress? If they had been dressed like anything other than what they were, it wouldn’t have been believable. 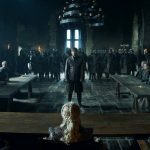 Dinklage is the only member of the cast to get a nomination for S6? Wtf! I don’t mean anything against Dinklage, but I can think of at least 4 other actors/ actresses who should have been nominated instead of him. These people don’t really seem to watch the shows they are nominating. It sort of gives one an idea how the actual awards will pan out. Expect another ridiculous Downton win for the ensemble award. Ghost is the only adornment the KITN needs to look badass again. I hope he makes an appearance this season. Winter came to the capital, the foggy day suits for a dark scene. 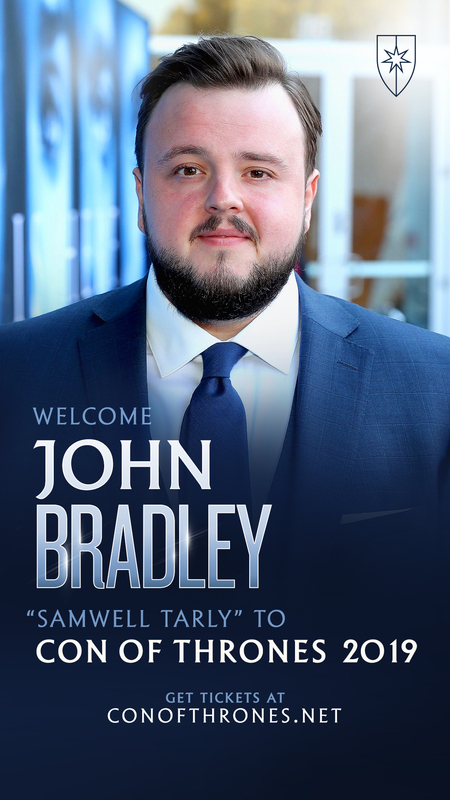 It looks like John Bradley will be involved in tomorrow’s filming. Now this is surprising. Is Sam going KL or will there be some filming for Oldtown as well? I guess the latter? Too bad Ghost is never with Jon anywhere. They do watch the shows (certainly the big ones, which dominate the drama awards). 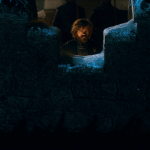 Dinklage is just a crowd favourite, even when Tyrion has very little to do. Stranger Things gets two nominations in the female category, but Lena and Evan Rachel Wood don’t? I loved Millie Bobby Brown’ performance, but I wouldn’t put that (and Winona Ryder’s) ahead of Lena and EVW. Idk, some of these noms feel weird to me. Don’t forget about Anthony Hopkins. He should’ve been nominated instead of Peter. Ghost is the only adornment the KITN needs to look badass again.I hope he makes an appearance this season. If Ghost does appear next season is probably to get killed off, because that’s how they treat the direwolves in the show these days. I feel like if the rumors that she gets captured are true, she pretty much has to live just for narrative reasons. Theon is the main character of the Greyjoy plot line, so if you’re going to kill off Yara, you would want to do it during the actual battle rather than capturing her and killing her later,so that Theon can actually witness it. 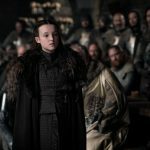 If you’re going to the trouble of capturing her, it seems like it has to be in service of some role-reversal rescue effort by Theon. That doesn’t mean that Yara’s story may not get profoundly unpleasant this season, but I really doubt it ends here. The direwolves are MIA most of the time. Adding some detail in the clothing doesn’t make it pompous. I love it! Long live, Darth Cersei! Hey, I’ve got that same black Yankee’s cap! Comes in handy when this dyed in the wool Red Sox fan and NYC resident wants to go incognito. afeastfordances: If you’re going to the trouble of capturing her, it seems like it has to be in service of some role-reversal rescue effort by Theon. 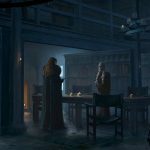 Back when WotW first reported the story that ‘one of the Greyjoys is captured’ this was exactly the scenario I considered. I’d been thinking Yara is captured while Theon escapes but later redeems himself as an Ironborn, a Greyjoy and a man by killing Euron in either revenge for Yara or in rescuing her. With the spoilers since then I don’t know that it’s setting up well for that as there doesn’t seem to be enough time – this season anyway. We also haven’t seen much concerning Theon since those beach shots so who knows what he’s up to.? No Iwan??? I would have thought he was in as many episodes as Faye. Huh. Flayed Potatoes: Adding some detail in the clothing doesn’t make it pompous. No, you’re correct. A little detail doesn’t, and Jon appears to have a little more deco to an outfit or two this season so we’ll see. I’m mainly referring to the highly decorative, gold and jewel encrusted wardrobes of the rich in the southern regions. I had to laugh – umbrellas desperately in place to hide them, but Thor with his pink umbrella is just walking along not giving a f*ck. ? Rheon was in 5 episodes (601-4, 609), whereas Marsay was in 7, the most of any guest actor this year (and more than quite a few regulars). She actually appeared in two episodes more than Wlaschiha, who also missed the cut, having only 5. Rheon was in 5 episodes (601-4, 609), whereas Marsay was in 7, the most of any guest actor this year (and more than quite a few regulars).She actually appeared in two episodes more than Wlaschiha, who also missed the cut, having only 5. Drat! Seems a shame, especially as it was his last season, but oh well, numbers. ? Have we found out if they are filming an Old town scene with Sam or is it a Euron/Sand Snakes scene? She looks beat up. 🙁 I feel sick about what’s going to happen to Yara in S7. Between Euron, Cersei, and the Mountain…yikes. If Mylod is there then we have (NEAR) confirmation it’s episode 2 or 3! afeastfordances: : If you’re going to the trouble of capturing her, it seems like it has to be in service of some role-reversal rescue effort by Theon. Until proven otherwise, I don’t think time (or lack thereof) should be an issue for the aforementioned Yara rescue effort. 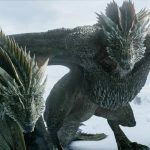 Much of the recent filming spoilers (the last month or so) have been focused on two events in the upcoming season: the ambush sequence and the wight expedition. How much screen time will be dedicated to each? 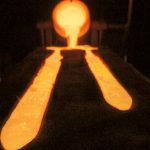 According to Luka, approximately 15-20 minutes for the former in episode 4). I assume the latter will have a similar amount of screen time (in episode 6). Even allowing an extra 5-10 minutes in each episode to set up these two battle sequences, that should leave plenty of space for other story lines in the second half of the season, including a possible rescue mission for Yara. As for Theon, it is true we have not heard much about him, spoiler-wise, since the exciting days of Bilbao and Seville filming. Fortunately we know more about Alfie Allen’s filming schedule. Over the last three months (September to November), he had been spotted in Belfast (based on social media) in at least six different weeks (2 in September, 3 in October, and 1 in November), in addition to the 3 weeks he spent filming in Spain with everyone else. While he hasn’t been spotted in any known filming location this month yet, Alfie Allen mentioned in an late-August interview (Guardian) that he was scheduled to film in four different months for the upcoming season, so it is most likely he still has some filming left to do, either before of after the end-of-year holiday. I really hope we’ll hear more about Theon within the upcoming weeks/month. And as far as Yara is concerned, I doubt she is going to be executed together with Ellaria and Tyene, despite being a part of this parade in King’s Landing. She is Euron’s problem, not Cersei. While Cersei might want to do some fun with the Dornish ladies in the name of revenge, I think she will leave Yara for Euron to deal with. So Yara is there too..oh well. Yes, it makes sense that he is the director here, considering he was spotted scouting in Caceres back in November. Well, these ladies certainly didn’t last long in the alliance with Daenerys… like, an episode or so. I imagine a lot of viewers will be questioning why they split off from Dany’s side when they didn’t have the strength to stand up on their own before. We may now have ANOTHER reason why Tyrion & Davos sneak into KL though if they’re still captive by that point… Tyrion does know the way out of the cells after all. I really like her, we must hold out hope! I’m so glad Michelle came back, I love the outfits she does. Her talent is shown in how good Cersei, Dany, Missandei, even Jorah look so far this upcoming season. I absolutely agree – time is not an issue. This is really something that excites me. I expect and hope that season 7 will be a rather big one for Alfie Allen. It is true that he has been filming far more than people have noticed already and it makes me very happy. My god, that horse’s gear is fabulous. ? 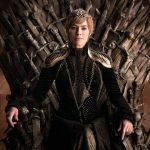 I imagine there is meant to be a contrast between Cersei’s clothing and Jon’s to show that Jon cares about ruling above his outfits. 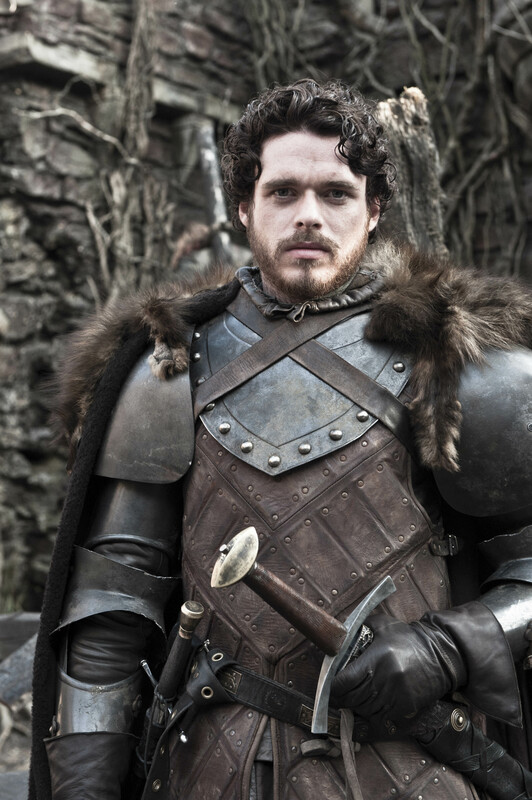 I know Robb had better clothes but he died in them so they couldn’t be passed to Jon and Robb probably already had clothes fit for the future Lord of Winterfell made. Jon has just died and left the Night’s Watch to become KITN so there has probably not been a lot of time for him to get lordly clothing made, even if it was his style to do such things. 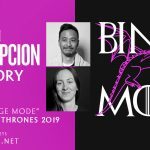 I don’t think they are trying to make a contrast between their clothing, if they were gonna do that with anyone more likely Cersei and Dany but considering everyone is wearing black I don’t think that’s where they are going with it. 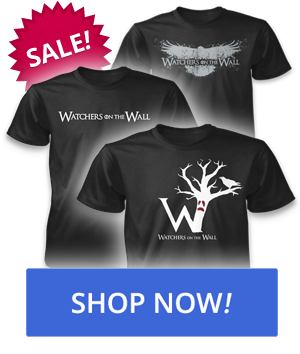 Southern people in Westeros always care more about clothes than Northerners ever will. Southerners are very vain in that way, their appearance is very important to them, you can tell in Sansa’s change of style in the beginning of the show she had basic clothes and cute braids even though she was a lord’s daughter but when she went to kings landing she wore bright colored beautiful dresses and extravagant hairstyles and then when she went back to the North she went back to simpler dresses and simple braids like her mother wore. For Northerners it’s not about style but practicality and keeping warm.